Toy Giveaway Winner Announced! - Super Inky! Hi everyone! 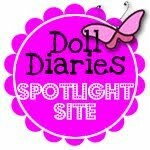 Today I am going to be presenting the entrants and winner to my 2012 Toy Giveaway contest! 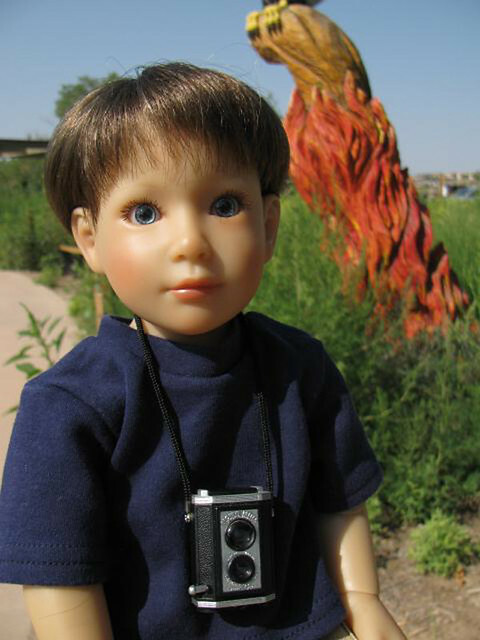 Remember, the entrants each had to submit a photo of themselves with their favorite toy or accessory. The prize pack for the First Place Winner includes a Lalaloopsy Mini Doll, Cheburashka Plush, Gragon Uglydoll, and Squishable Micro Narwhal. Without further ado, meet the entrants! 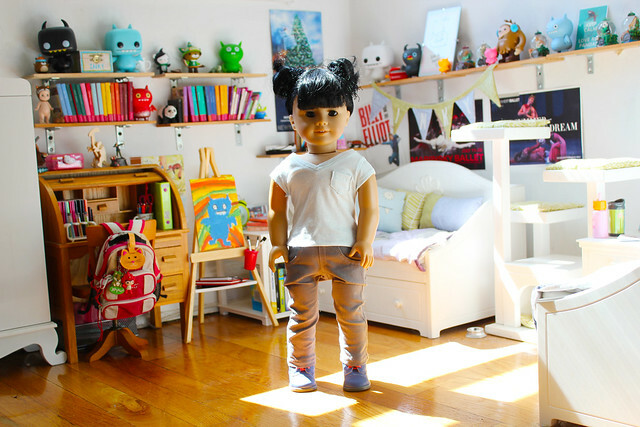 "Kanani's favorite thing is her collection of dolls. She loves them so much that she built them a 3 story house to live in (complete with a bathroom!). 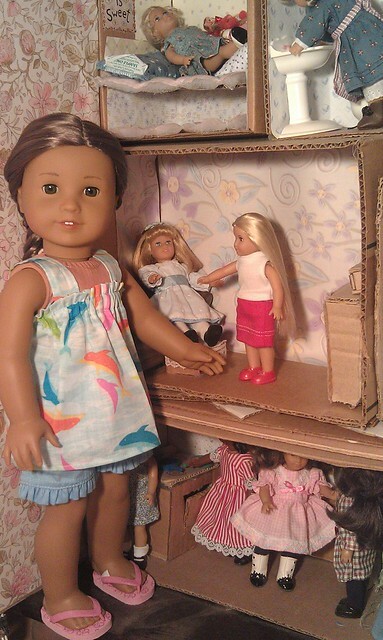 She loves to pose them around the house and take pictures of them." 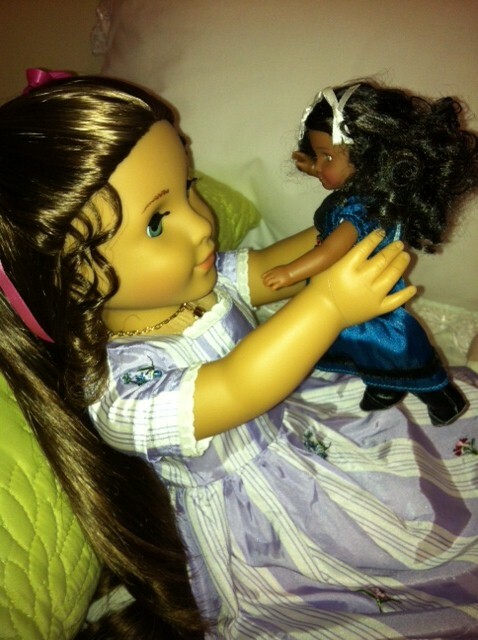 "This is a picture of Audrey and her doll, Jill, and Jill's dress. 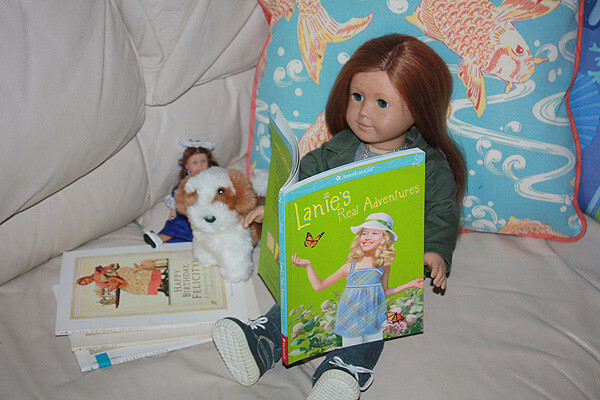 Jill is Audrey's special doll that her friend made for her." "This is me with my favorite bag, and Kate with her favorite necklace and sunglasses." "Greetings from Nunavut, Canada. I love all things Artic, especially stuffies. This is me with my narwhal and my polar bear. I couldn’t decide between them!" 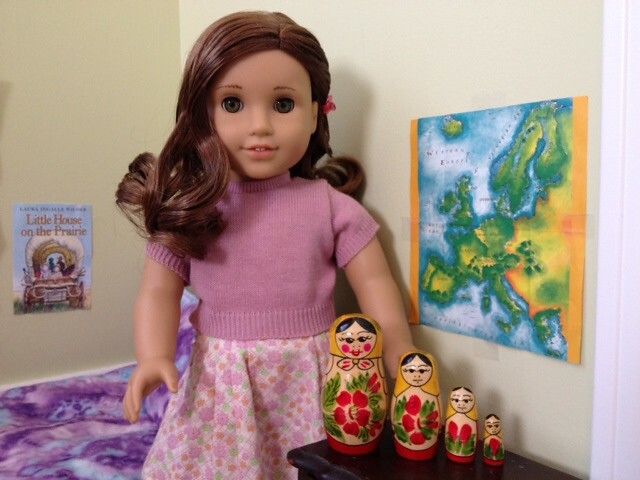 "My name is Nadya, and I was adopted from Russia earlier this year. One of the treasures I brought with me to America is my matryoshka doll set. My Mama gave them to me when I was very little. 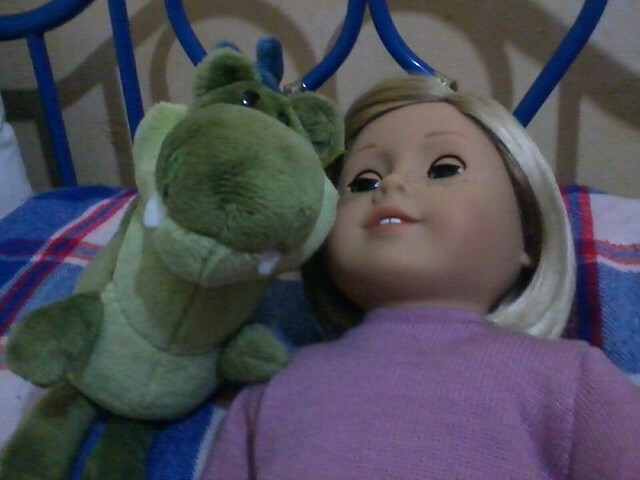 They belonged to her mother, who got them from her mother, so the dolls have been in my family for a long time. 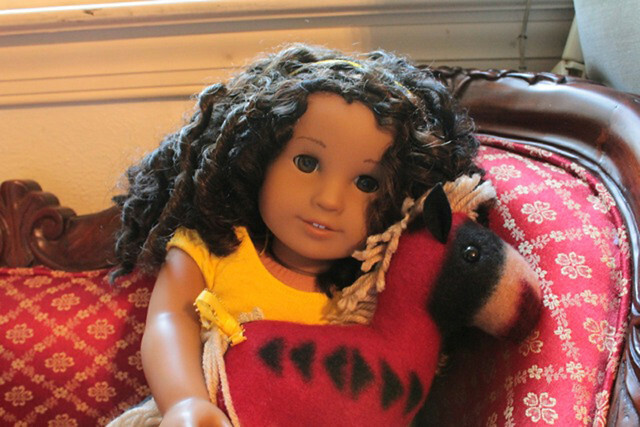 I love my dolls because they remind me of Mama and the country I'm from." 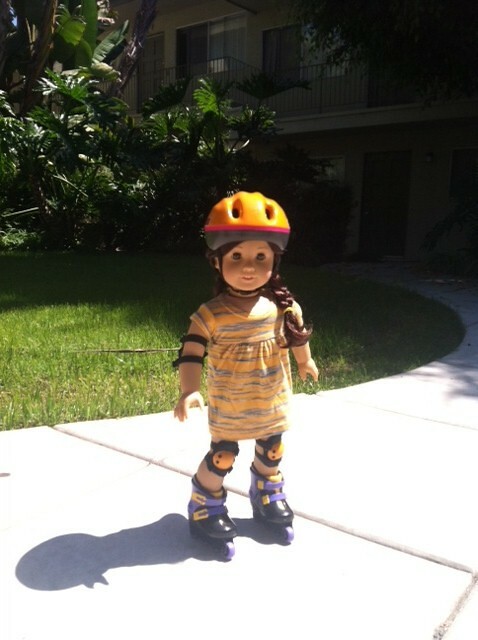 "Jess likes in-line skates since moving to California because it's a very popular and convenient way to get places faster than walking. Her mum yells at her if she doesn't wear her helmet and pads." 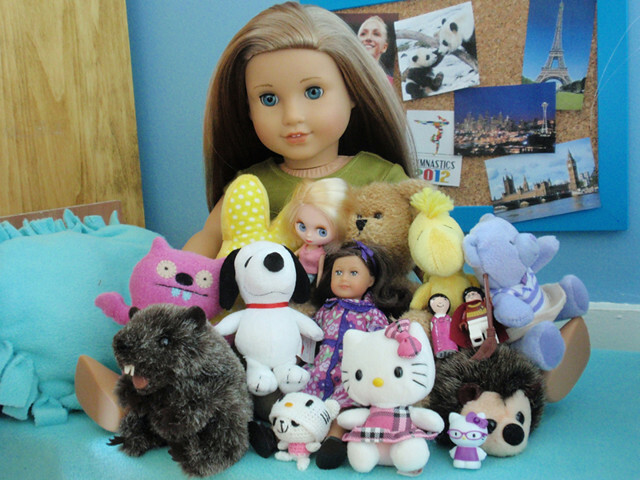 "Aedon's favorite toys are her AGs which she collects, but her Kit and Ruthie are her *absolute* fans." "Pippa has recently received a kitten thanks to the assistance of Inky's family. She argues that the kitten (now named Corrie) is her prized 'accessory' because Corrie follows her everywhere. 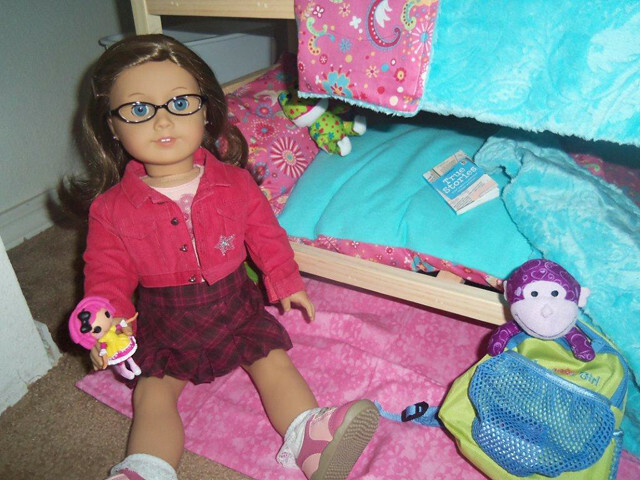 Pippa loves to cuddle and play with her new friend and isn't looking forward to going to school. She wishes her mom would let Corrie come with her!" "Lynsy loves monkey’s, but not just normal easy to find monkey’s but GREEN monkey’s. 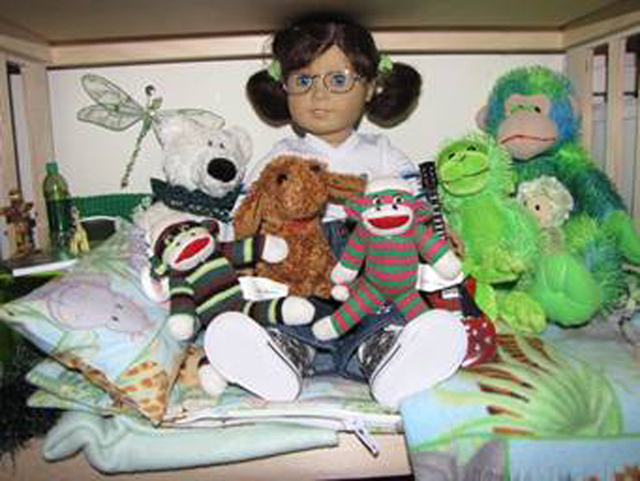 Here she is with her green monkey collection. 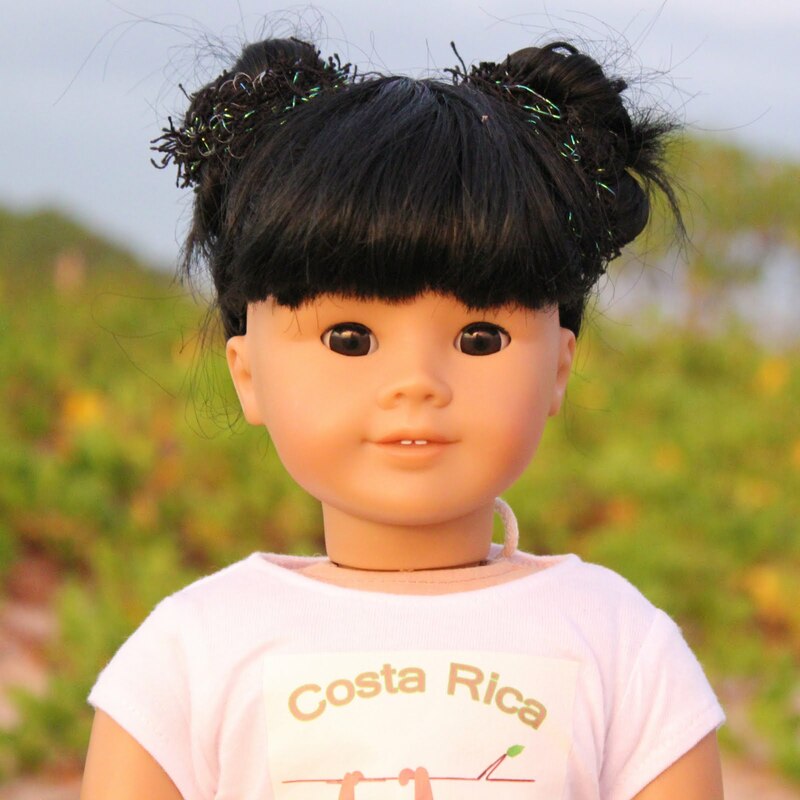 Knowing that someone took the time to find a green monkey for her makes her collection even more special." 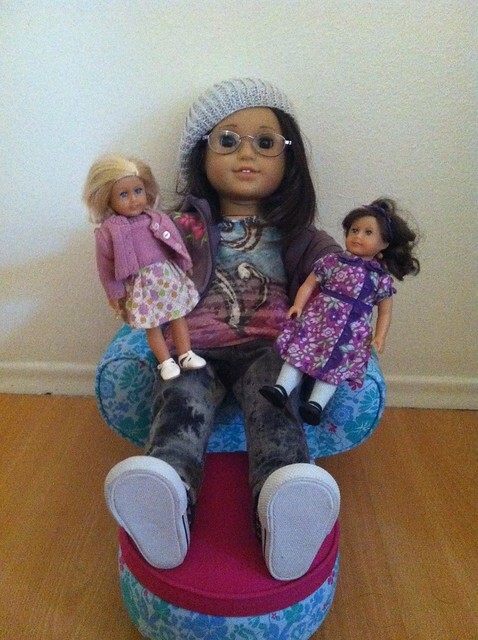 "My doll's name is Madison. She is 10 years old. She has a pet dog named Pepper who is wearing sunglasses and playing the ukelele in this picture. Madison's favorite toys are stuffed animals. 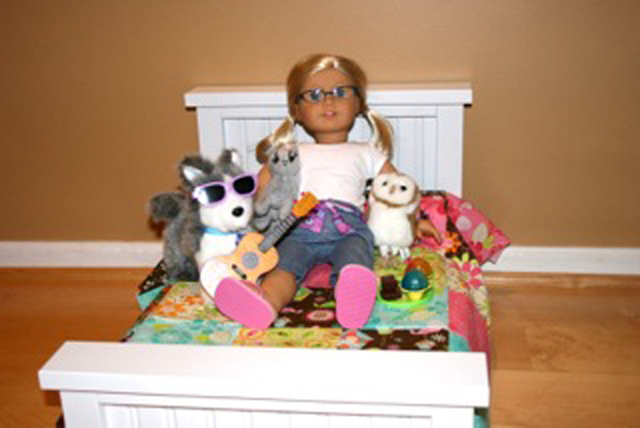 Here she has a Webkinz cat and a barn owl stuffed animal. She is sharing three brownies and two shave ices with them. Her mom said it's not okay to eat food in bed, but it would be okay for this picture." 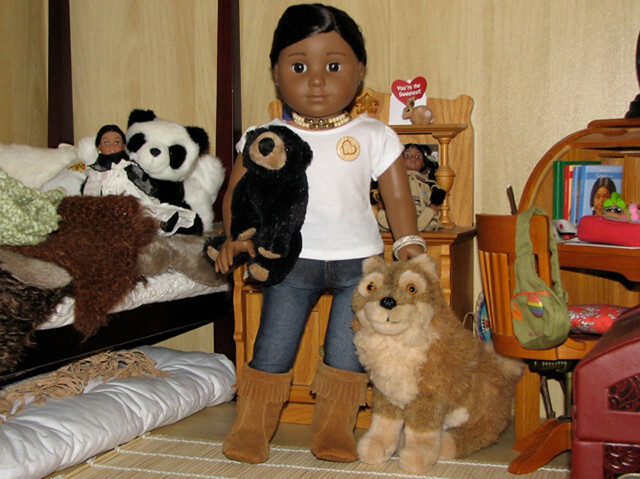 "Well, this photo has lots of my favorite things in it: my Kaya doll and book, my Josefina doll, my Panda, black bear, the card Rebecca gave me for Valentine's Day last year, and of course the two pins you gave me, and the moccasins I'm wearing, which my grandmother got for me. But my absolute favorite thing is my dog, Tatlo. I named him after Kaya's dog in her stories, since she is my mini me and her Tatlo is the mini me of my Tatlo. Anyway, he's my best non-human friend. He likes to go for walks with me, he sleeps at the foot of my bed to protect me, and I can tell him anything. He is a super dog and I feel very lucky to have him. I rescued him from the pound. He was just a skinny puppy when my family brought him home, and look at him now!" "Hi! My name is Zuni and this is my stuffed horse named "Gallup". I got him when I was 3 years old from a nice Navajo lady at a craft fair. He was so big for me at the time that I used to pretend to ride him! Now I just cuddle him when I'm feel sad." 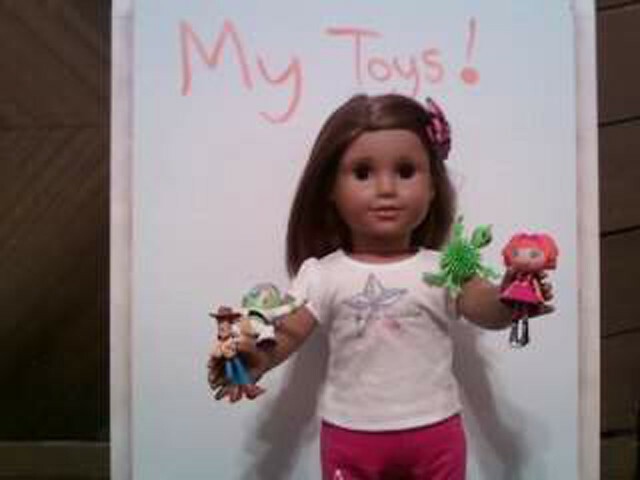 "I wanted to enter your contest with my Lalaloopsy doll. She is my absolute favorite toy. You can see my Build-a-Bear monkey in my backpack, too. The ones on the bed behind me are my little sister, Rosey’s." 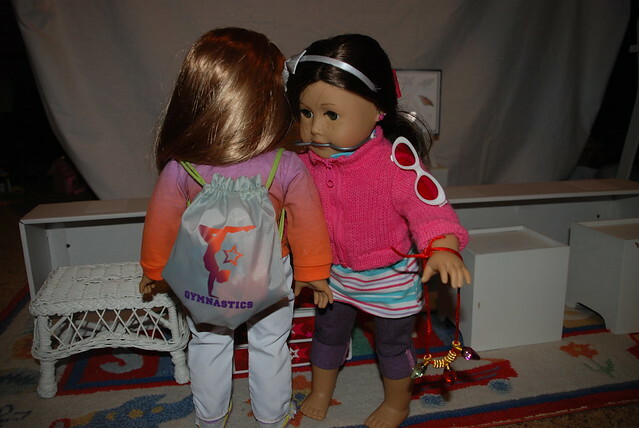 "Sofia shows her new friend Pippa her large collection of Squinkies! The two 11 year olds make a big mess playing with Sofia’s toys!" 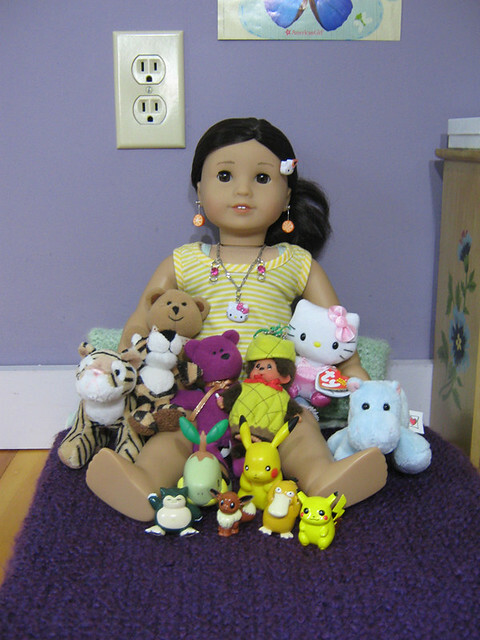 "My doll couldn't choose one toy, because she loves them all equally." "I love my build-a-bear because i do everything together and on rainy days i snuggle up with her and read a good book to her :)"
" In this are my favorite toys. My Bea spells-a-lot, Woody and Buzz, and My Alien George. But of all my favorites I love Bea the most. " "In my picture, I am with many of my favorite toys; I couldn't pick just one! I have my special bear (the brown one), my Beanie Baby bear (the purple one), my Webkinz, the tiger I got for my birthday, the Hello Kitty I got for my birthday, my Monchhichi, and all of my Pokemon figures! These are all my favorites. They are my favorites because they all have a memory that go with them, or they helped me through a hard time in my life. For example, my special brown bear I've had since I was a baby, and he helped me feel less upset when I had to move and when I missed my mom. " 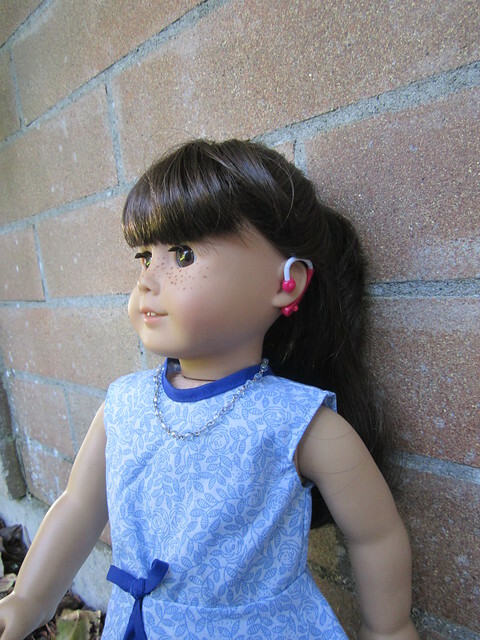 "Jillian loves her Hearing Aides as they really help her hear better and they are her favorite colors." "My favorite toy is more of a family heirloom. My Great-Aunt Molly refurbished her old Brownie Reflex camera and passed it along to me. I am starting to suspect that when Great-Aunt Molly refurbished her camera, she added some magical photo-editing powers. It makes everything look vintage-including photos of me!" 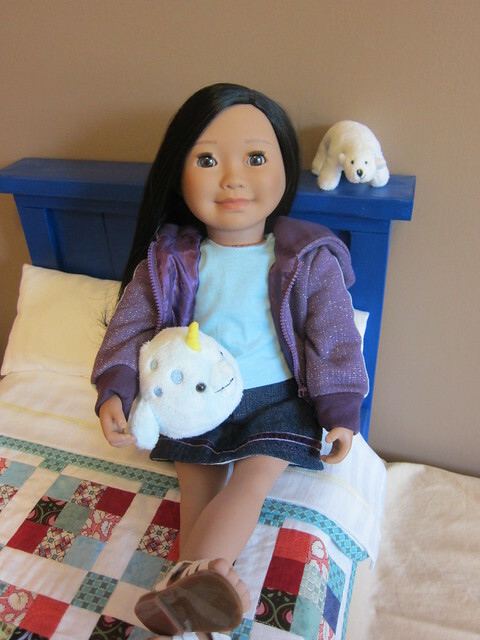 "Here is Emmy(jly 37) with her toys mini Julie and a stuffed duck that quacks! " "OK, I hope you guys will like it! ^_^"
"My dolls Sophia and Emma are showing off their homemade kaleidoscope (it actually works), it is definitely one of their favorite things." "I don't know if I'd call my favorite thing an accessory, but I really love books! Sometimes I read them by myself, but I also read to my dog a lot, so that's the picture I'm sending you. I think he's really impatient for me to finish Lanie and start on the Felicity books!" 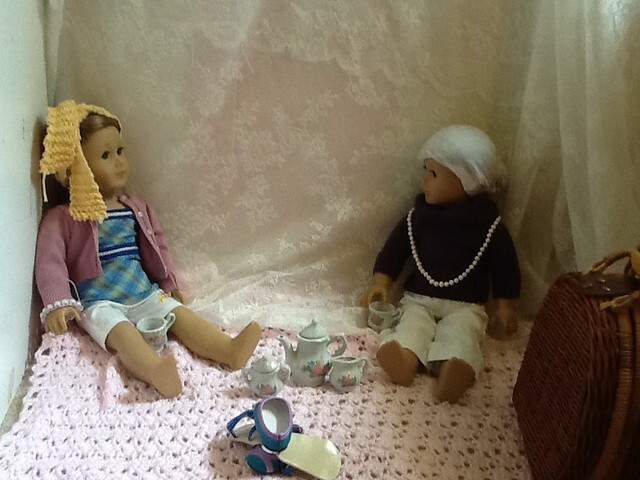 "My doll Katie's favorite toy is her play tea set! Her grandmother is more than willing to play ''tea'' with Katie, and sometimes she brings a picnic along." 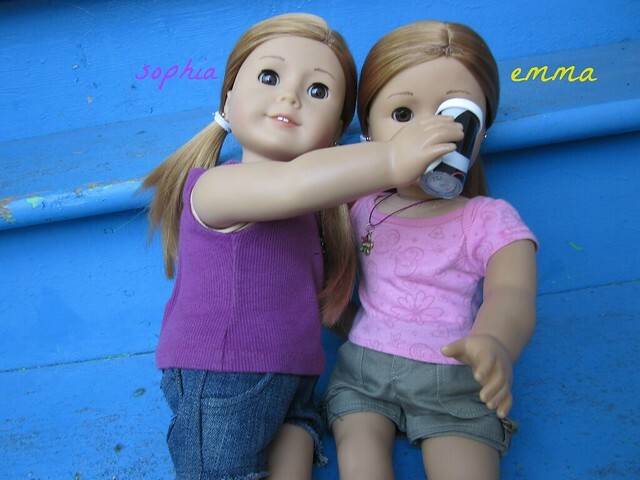 "Marie-Grace was very excited to be reunited with her best friend Cecile. But she couldn't figure out how she had shrunk! ;)"
Congratulations to Sofia & Pippa! You have one week to claim your prize by emailing your address to inkymarina@gmail.com. If I do not hear from you by September 8, I will choose another winner! Thank you to all who participated! I had a great time looking at all your entries! What great photos everyone! 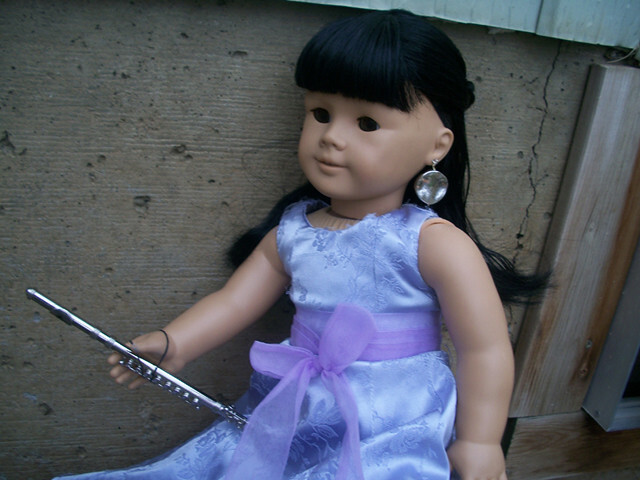 I love the one of Saila though, she is my favorite Maplelea doll without a doubt. Great photo's .. we had a good time looking at all the entries .. congrats to the winner .. have fun with the toys and adding new ones to your old ones. I loved seeing all the photos. The contest had such a great turnout, with so many entrants. I can't wait until you do another giveaway.